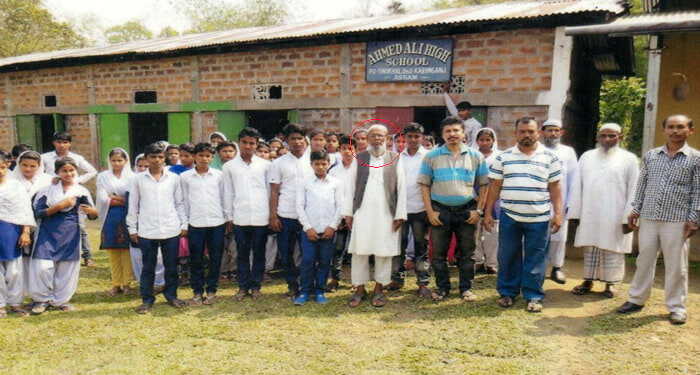 Ahmed Ali (encircled) with students in front of a school that he has set up. Paddling his cycle rickshaw through the narrow lanes of Barak Valley’s Karimganj town, young Ahmed Ali would often ferry little children to school. Sometimes, he would ferry teachers as well. Interacting with them during those bumpy rides, Ali would often lament that while children in the towns get the opportunity to receive education; those in his village, some 40-km off at Patharkandi were deprived of such an opportunity. Ali never went to school and is illiterate. He can only speak or understand Sylheti, a Bengali dialect spoken in Barak Valley. But the simple man had a vision for life that even the greatest of intellectuals would fail to frame. The regret gradually instilled in him a resolve to do something for the children of his far-flung rural region. Being a rickshaw puller, Ali hardly had resources but did not lose heart. After a hard day’s work, he started spending the evenings in cutting earth to earn as much additional wage he could. 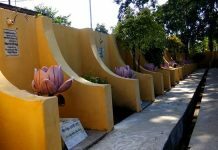 The toil bore fruit and in 1978, Ali was able to start the first school in his village, which is now a Middle English school provincialised by the Assam government. Establishing even one school is no mean task and most would sit on the laurels and bask in the glory. But for Ali, that was just the beginning! With an unmatched zeal, he continued to invest whatever he earned to set up one school after another. While Ali was on his school developing mission, fellow villagers suggested that he should instead work towards establishing some madrassas for religious education to Muslim children. Ali declined. He asserted that unlike West Bengal where madrassas impart modern education to students from all religious background, in Assam they stand to benefit only Muslim children. But he wanted an opportunity for all the children of his village and the surrounding areas. Now, 40 years later, the humble bearded rickshaw puller has facilitated the establishment of nine schools in Patharkandi subdivision by donating 30 bighas of land to the government. In recognition of his outstanding contribution, Prime Minister Narendra Modi appreciated Ali in ‘Mann Ki Baat’ radio broadcast last year. 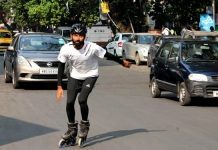 Last Sunday, the now 82-year-old Ali was invited to Delhi to attend a Doordarshan programme, where many such real-life heroes mentioned by Modi in his radio broadcasts were called and felicitated. 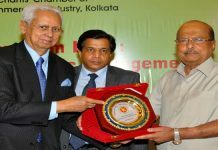 During an informal interaction hosted on the sideline of the event by cybersecurity expert Subimal Bhattacharjee, Ali revealed that he is not satisfied with the feat. The octogenarian now wants to set up a junior college in his village. “The girls must study beyond class X and explore as many opportunities as boys,” Ali said.